La Thuile is found on the Italian/French border, with summer road links to La Rosière in France. This is the home of the St Bernard dogs, named after the pass over the border. It's at the top of the Aosta Valley, where weather conditions can be variable, with high winds particularly problematic. There are 150km of lift-linked pistes, offering skiing for every ability level, although the Italian slopes are slightly better than the French. For beginners and intermediates, there's plenty of good terrain, but they will have to take a lift up, as most of the resort runs are tree-lined blacks. These tougher runs are lower down, so can have poorer snow. For experts there is enjoyable off-piste potential, as well as superb heli-skiing at reasonable prices. Snow is better in La Thuile, because of its north-facing slopes, but intermediates will find more challenges in La Rosière. This is also a great place to learn to board and is helped by an up-to-date lift system. 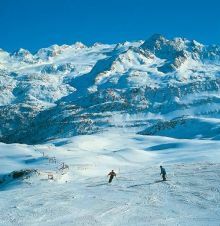 La Thuile is a relatively unknown resort outside of Italy and remains largely Italian in character. This means that, apart from over the weekend, it is refreshingly uncrowded. The locals are very friendly, which easily makes up for the general lack of spoken foreign languages. La Thuile mainly caters to the family market, so après-ski/nightlife is pretty limited. As with the majority of Italian resorts, organised childcare is not exactly the greatest strength. The town itself is attractively set in woodland and offers some decent eateries. Mountain restaurants and non-ski activities are not particularly brilliant. 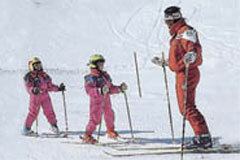 Ideal resort for beginners or intermediates. 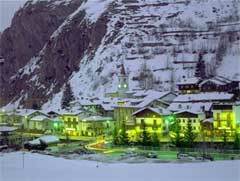 Linked with the French resort of La Rosiere.